Vibrant 14k White gold Pink Sapphire diamond ring. Stunning ring is set with 1.17ct genuine Pink Sapphire and diamond accents total 1/2 ct. Diamonds are SI1-2 clarity G-H color. This ring is a bold 8mm in width and weighs about 6.9grams. You'll love this stunning ring. 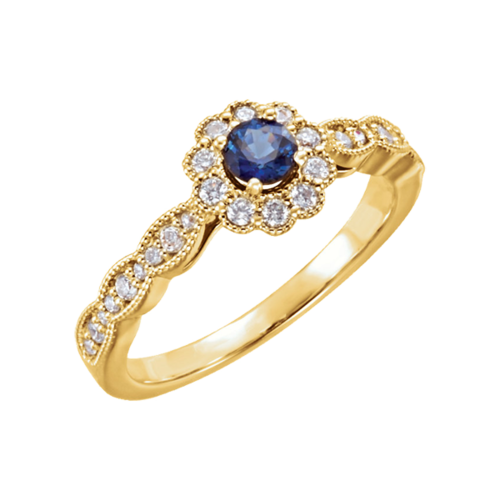 Beautiful 14k gold Sapphire and diamond ring. This made to order ring can actually be made just about any way you want it. 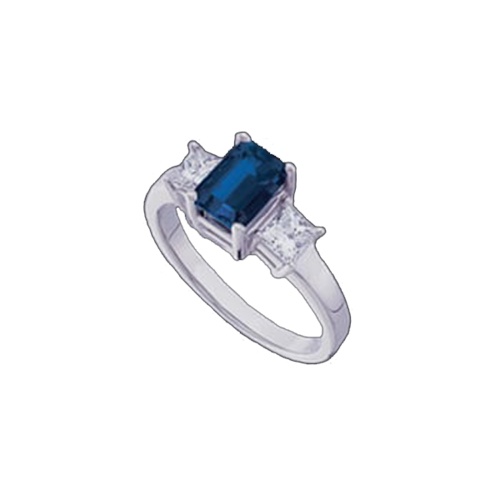 Price shown is for the 5x5mm center Blue Sapphire with SI2 diamond accents. If you like this ring size it can be created with just about any gemstone in round, oval, cushion, asscher, emerald, square, or marquise. Any metal choice. Have it Your Way. Use our request for pricing. 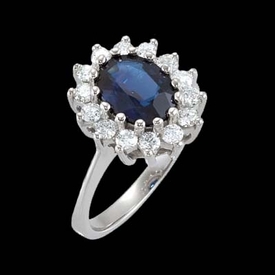 Blue Sapphire Cabochon & Diamond Ring. Pretty 14k White gold Blue Sapphire and Diamond ring. Genuine Blue Sapphire cabochon measures 5mm round. Diamonds taper in size and total 1/6ctw adding a dazzling accent to the beautiful blue center. Pretty 14k Gold Blue Sapphire and diamond ring. 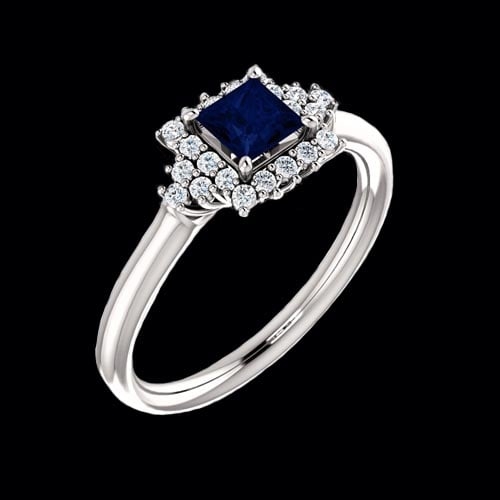 This great design is available in 14k white or yellow gold and is set with 1/3ct tw diamond and a 4mm round genuine Blue Sapphire. Alternates to the Blue Sapphire are Emerald or Ruby. Ring weighs 3.81grams. Made to order ring. Gorgeous 14k White gold Pear cut blue Sapphire and diamond ring. Genuine pear cut beautiful blue Sapphire is a 1.43ctw stone and is surrounded by .93ct tw SI 1 clarity G color diamonds. A brilliant design you'll love. 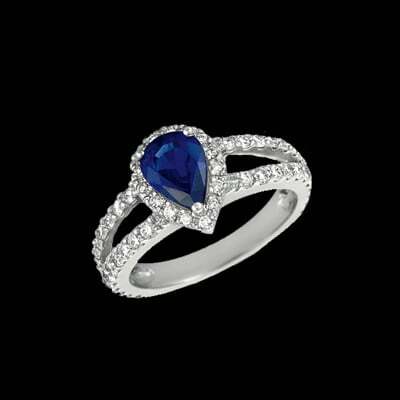 Pretty 14k white gold Blue Sapphire and diamond ring. 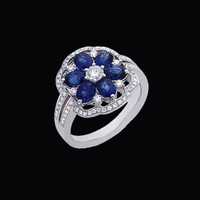 Oval sapphire is a .42ct stone and accent diamonds total .06ct. A very feminine ring. Stock size of this ring is 6.5. The Sapphire is Septembers birthstone. 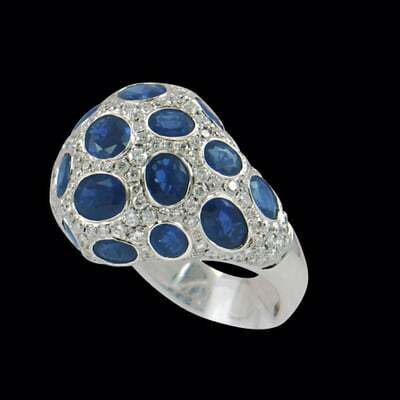 A delight for the eyes, 14k white gold blue sapphire and diamond ring. This ring features blue sapphire and diamond floral design along the top. A precious ring, great for everyday wear. Lovely 14k white gold Sapphire and diamond ring. Blue Sapphire gemstone is the focal point of this ring, it's a beautiful blue color and weighs 1.38ct. Diamonds set either side of the center are round SI 1-2 clarity G-H in color. Brilliant diamonds total .80ct tw. 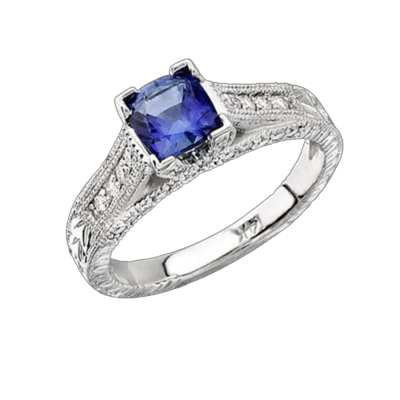 Tantalizing Blue Sapphire and diamond ring set in 14k white gold. Beautiful blue sapphire is oval in shape and measures 1.74ct. Diamonds on either side of the sapphire total .30ct tw and are SI1-2 clarity G-H in color. We are happy to size this ring for you. Breathtaking 14k White gold Sapphire and Diamond ring. 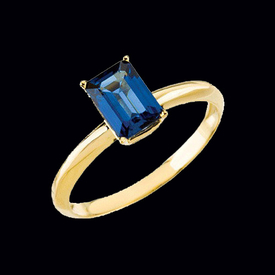 This gorgeous ring features a princess cut center Blue Sapphire that weighs 1.61ct. Diamonds accent the vibrant center on all sides with double milgrain borders and the remaining shank of this ring has an engraved design. The diamonds are SI 1-2 clarity and G-H color, they total .45ct tw. You'll love this ring. Dainty blue Sapphire and diamond ring. 14k white gold Sapphire and diamond ring is set with a 6x4mm oval center sapphire and surrounded with 1/6ct tw diamonds. 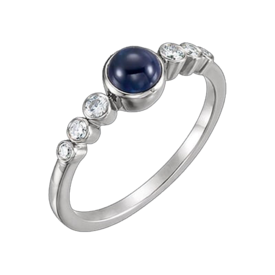 Sapphire White gold Ring. 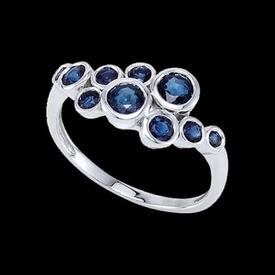 You'll love this fun style with beautiful blue Sapphires set in a bubbly white gold design. Round genuine blue sapphires measure 2mm, 2.5mm, 3mm, and 4mm. Sapphires total 1.40ct tw. 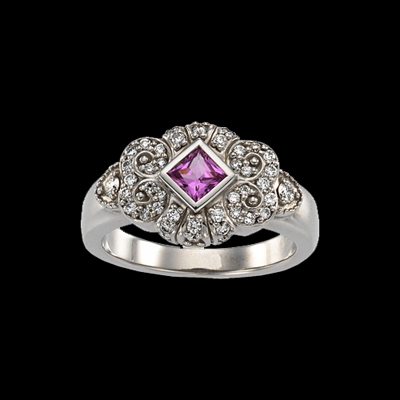 This ring is just one of the many gemstone jewelry items you'll find at Gracious Rose Jewelers. Gorgeous Vintage design 14k White or Yellow gold Pink Sapphire ring. 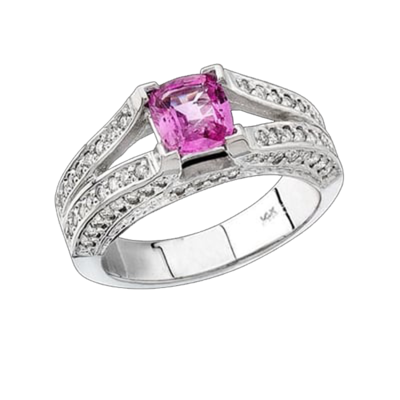 Center Pink Sapphire measures 4x4 square accent diamonds total aprox. .20ctw. Very pretty ring. Lovely Blue Sapphires and brilliant diamonds create this flower design ring. Genuine blue sapphires total 2.06ct tw and SI 1 clarity G color diamonds total .54ct tw. This ring is also available in 14k Yellow, 18kt metals, and Platinum, use our request for pricing. 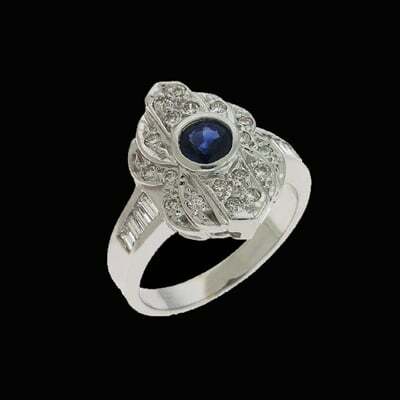 Pretty 14k White gold Antique design Blue Sapphire and diamond ring. Ring is set with a round Blue Sapphire that total aprox. .70ctw and surrounded by .57ctw diamonds. Baguette diamonds are channel set on either side of the center design VS2 in clarity G in color and total .30ct tw. Round diamonds set in the center design are SI 1 clarity G in color and total .27ctw. Lovely ring, also available in 14k yellow, 18k metals, or Platinum. Custom non returnable ring.